This fine collection of Louis Rousselet jewelry includes necklaces, earrings, brooches, and parures made in France from the 1920s through the 1950s. His pieces were usually signed only with a paper hang tag. Jewelry with the L.R. mark is rare, but you will find a few signed pieces here. 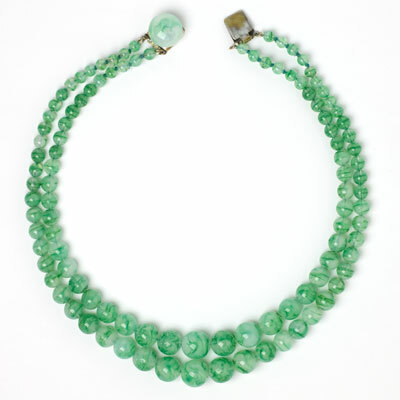 Rousselet manufactured glass and Galalith beads and faux pearls that he used in his own designs and also sold worldwide. Because his components and findings have a distinctive look, in some cases I have been able to attribute particular works to him. When in doubt, I have added a question mark to his name as “Maker”. Read more about Louis Rousselet. 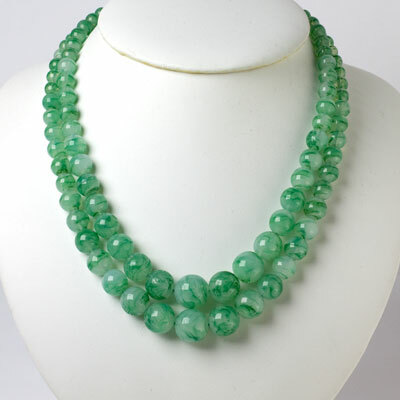 Graduated glass beads in a soft-green with swirls of color form this two-strand French 1950s necklace. I think it was made by Louis Rousselet. (As you may know, few of his pieces were signed directly on the jewelry – instead, a paper hang tag was used.) The clasp, which is the type he typically used, is topped with his well-known button-shaped bead. This necklace from my personal collection was recently professionally restrung. 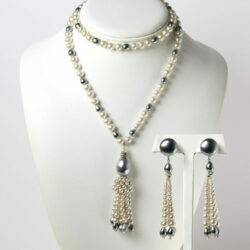 This sautoir necklace and earrings set is a stunning Art Deco-style creation made with faux grey and white pearls for Coco Chanel’s boutique in 1948-1952. The white pearls are round; the grey, tear-drop shaped. The fringe pendant is capped with a rondelle. I bought this set for my personal collection from Ginger Moro, author of European Designer Jewelry and Rousselet expert. This set appears on page 67. The necklace broke when I wore it to my favorite nephew’s wedding. When I had it professionally restrung at a slightly shorter length, my jeweler created a bracelet. I'm including it with the purchase of this fabulous set. These jade bead earrings feature clusters of vibrant dark-apple-green-glass barrels cascading from French ear clips. Some of the beads have striations. Though unsigned, these delightful 1950s creations feature the same style of ear clip typically used by Louis Rousselet. What’s more significant is the way the earrings are constructed: on the backs we see the flower-shaped links to which the beads are wired, a unique trait of this maker’s work. (Note that he typically signed his pieces with only a paper hang tag.) These playful and unusual earrings are perfect for any occasion. These blown glass ear clips have clusters of beads in greens, purples, and reds, along with pearls. This pair was made by Louis Rousselet, according to Ginger Moro (the author of European Designer Jewelry and a Rousselet expert). Though marked "Charlin" on the ear clips, these pendants are "a re-issue of an earlier design from the '50s using vintage glass beads and pearls", stated Moro in correspondence, when I bought these earrings from her. The colors and design make this pair very versatile and easy to wear for day or evening. Clusters of tiny faux pearls with blown-glass flowers and leaves form these 1950s ear clips. The design and style of the beads remind me of the work of the French maker Louis Rousselet, although the earring backs are not the same as those he typically used. However, the findings I'm familiar with would have been too small for this creation. Please note that although these earrings are not mirror images, the lack of symmetry – which is not unusual in hand-strung pieces – does not detract from their lovely appearance. What a great choice for a bride! Glass pearls and emerald-green-blown-glass beads are hand-wired onto gilt metal in this 1950s French brooch with a trombone clasp. This beautiful three-dimensional piece is in the style of Louis Rousselet. Note that his work was usually signed only with a paper hang tag, so most of his surviving pieces remain unsigned. This spectacular brooch is right for day or evening wear. For a unique look, how about wearing this piece on a wedding gown? Scroll down to see French earrings from the same period and probably the same maker. A basket of glass pearls suspended from a large, single pearl dangle in these lovely 1950s French ear clips. Each pendant is held in place by a cluster of glass pearls mounted on a round, white-metal filigree back. This part is designed to adorn the earlobe. These charming earrings, though unsigned, have the traditional French filigree back and ear clip used by Louis Rousselet. (His pieces were typically signed with only a paper hang tag.) These earrings are as perfect for a wedding, prom, or special occasion as they are for everyday wear. Add a single strand of pearls and look extraordinary! 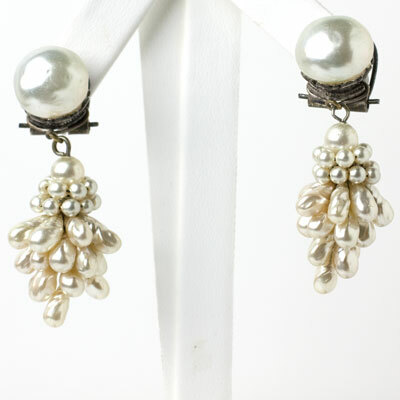 These 1950s pearl cluster earrings resemble a bunch of grapes. They are suspended from a large glass-pearl button mounted on a white-metal filigree back. Though unsigned, these ear clips have the traditional filigree back, ear-clip mechanism, and button-bead at the earlobe typically used by Louis Rousselet. Moreover, the unusual shape of the pearls could only have been made by someone of his caliber. (Note that Rousselet pieces were typically signed only with a paper hang tag.) These beautiful earrings are right for day, evening or bridal/ wedding/prom wear. Scroll down to see a gorgeous brooch with similar pearls and emerald blown-glass. 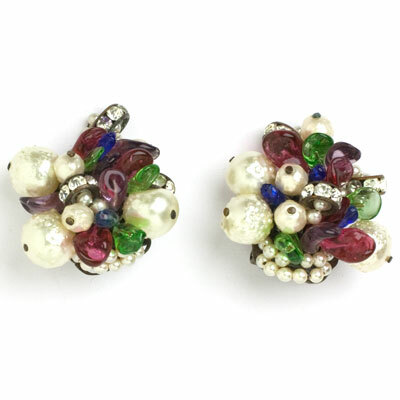 These 1950s French ear clips by Louis Rousselet feature faux pearls in various sizes, with accents of ruby, sapphire, emerald and amethyst blown glass leaves and rondelles. Though unsigned, these earrings match a signed necklace and earrings set that I have moved from my personal collection to offer for sale. The type of ear clip used is another clue to the creator, who usually signed his pieces with only paper hang tags. Louis Rousselet was the premier faux pearl and bead maker in the first half of the 20th century. These earrings are a beautiful example of his work. Although the coating on some pearls appears to have bubbles, I think they are intended. Scroll down to see the magnificent necklace and earrings set in the same design. This masterpiece of 1950s costume jewelry is an exceptional necklace and earrings set signed by Louis Rousselet. 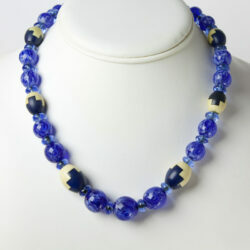 It features four strands of glass pearls with ruby, sapphire, emerald and amethyst blown-glass-bead and rondelle accents. (In case you aren't familiar with his work, you need to know that he was regarded as the premier faux pearl maker in the first half of the 20th century.) The necklace closes with a concealed clasp adorned with pearls and colored beads. The matching earrings are ear clips. Finding a Rousselet-signed piece is incredibly rare (most had only signed paper hang tags), which makes this necklace with matching earrings all the more extraordinary! Scroll down to see another pair of the same style earrings sold separately. 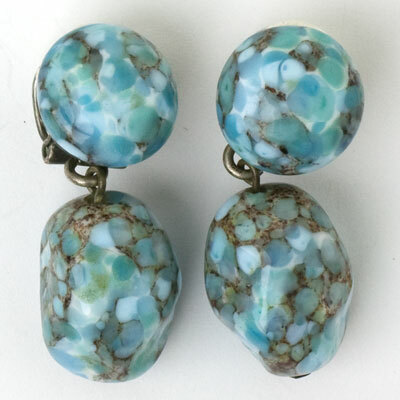 These vintage turquoise glass earrings may have been made by Louis Rousselet in the 1950s. 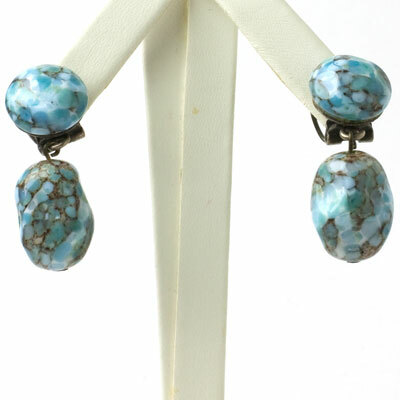 They feature a large turquoise art-glass nugget hanging from a matching button-shaped stone designed to adorn the earlobe. The filigree earring backs have the traditional French clips of the era – actually, they and the glass buttons are the same elements as those used by Rousselet. The art glass is stunning, and the color is gorgeous!